Begin w/ slip knot & ch 28. Row 1: Ch 3 (this counts as 1st dc st) and place 2 dc st in 4th chain from hook, dc in next 3 st, dc3tog, dc3tog, dc in next 3 st, *3 dc in next st, 3 dc in next st, dc in next 3 st, dc3tog, dc3tog, dc in next 3 st*, 3 dc in last st. ch 3 & turn. Repeat this same pattern for the length of your piece. Pattern Notes: If you are creating something larger than this pattern chain in multiples of 14 + 14 st. Follow the same pattern above and repeat the steps between each *. Watch the tutorial below to see what the pattern looks like, how to change color, and how to slip stitch your piece together. 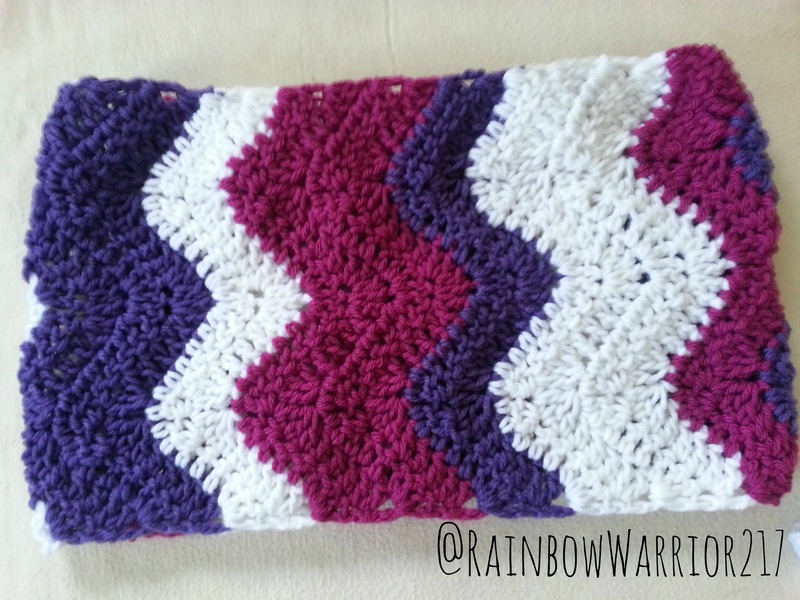 I originally intended on creating an infinity scarf but this pattern was nice & thick and I didn’t want the beautiful chevron stripes to get lost in a big piece. I am surprised how much I like the cowl and I LOVE the color scheme I went with. Send me any requests or questions you may have as well! Posted in Crochet Patterns, Video TutorialsTagged chevron design, crochet, crochet chevron, crochet cowl, crochet patternBookmark the permalink.